School’s Out! And so is an energetic Amish girl with trouble following close on her barefooted heels! When nine-year-old Rachel Yoder isn’t bringing frogs to church or taking wild buggy rides, she’s setting fireflies free and trying out new skateboards in all the wrong places. Will Rachel’s friends and family survive the mischief she brings into their lives — and will Rachel learn any life lessons along the way? And that’s where trouble finds her once again! Except this time, trouble has a freckled face and an unruly cowlick. His name is Orlie, and he seems determined to humiliate this nine-year-old Amish girl at every turn. Can anything good come out of Rachel and Orlie’s endless antics? Join Rachel as she learns life lessons about love and forgiveness in the rolling hills of Lancaster County, Pennsylvania. 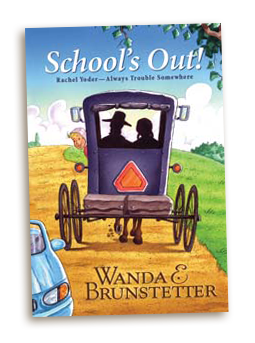 Rachel is driving her Amish friends and family buggy with her lack of patience, which brings her trouble at every turn. Will Rachel spend the entire winter getting into more trouble than her Lancaster County family and schoolmates can handle? Or will she finally discover that patience has its own rewards? Rachel has been out-of-sorts ever since her cousin Mary moved away. When a new girl, Audra, shows up at the Amish schoolhouse, Rachel soon finds herself with a stinky sandwich, a mud-spattered dress, a sore nose, and a rotten attitude. As things go from bad to worse, Rachel’s in danger of losing more than one friend. Will she ever learn the value of forgiveness? With the arrival of spring comes happiness and fun. Not for Rachel Yoder, though. She’s turned into a sour-faced grouch. Extra chores, a trip to the eye doctor’s for glasses, and a little white lie make things go from bad to worse for Rachel and her family. Will Rachel ever learn the secret to true happiness? As summer is coming to an end, Rachel’s troubles are just beginning. Not only does she have a new baby sister to deal with, but she has an ornery cat on the loose, too. Rachel begins to feel that life isn’t fair. When her jealousy leads her to take a trip to an amusement part without her parent’s permission, her problems only get worse. Will Rachel ever learn to be content? 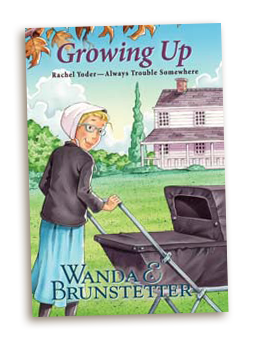 Rachel encounters trouble at every turn with her Amish friends and family when she spreads unintentional rumors as a result of her eavesdropping. From a little misunderstanding about Cousin Mary moving back to Pennsylvania, to a bigger and out-of-control rumor about her brother Jacob’s health, things go from bad to worse for Rachel. Will she ever learn that assumptions often have hurtful consequences? Rachel’s not enjoying school this year. There are so many other things she’d rather be doing than schoolwork. As she shirks her responsibilities, Rachel encounters everything from cows escaping the pasture to an overflowing sink, dirty sheets, and rotten eggs. Rachel wants to be all grown up, but she’s having a hard time accepting the responsibility that goes with it. Will she ever learn the value of growing up into a dependable adult? Whether Amish or "English," all children are alike in many ways. They're curious, humorous, adventurous, energetic, and sometimes full of trouble. Stories from my own childhood, and those of others, took my imagination on a ride into Lancaster County, Pennsylvania, where an energetic Amish girl named Rachel Yoder lives. When Rachel isn't bringing frogs to church or taking wild buggy rides, she's setting fireflies free and trying out new skateboards in all the wrong places. Just like every other child, Rachel must learn many life lessons along the way. 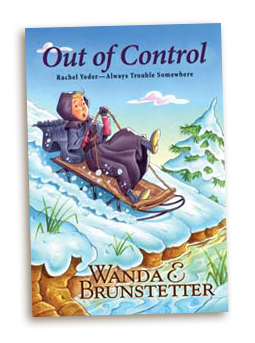 "Wanda Brunstetter brings children of various backgrounds together through Rachel and her adventures. Rachel may be Amish, but she's really no different than any other child; she has dreams and fears and responsibilities just as they do. She wonders if God listens to her when she prays, she worries her mother won't love her anymore for all the trouble she causes. Rachel's lessons are hard learned, but equally rewarding. Rachel and School's Out! is delightful." "Ms. Brunstetter's writing embodies warmth and understanding wrapped in an enjoyable setting with heartwarming characters. Don't hesitate to introduce the young girl in your life to Rachel Yoder." "My opinion on this book is — out of one through ten, with ten being the best — I would rate it a nine. This book, Out of Control, by Wanda E. Brunstetter, was one of the best books I have ever read in my entire life. It was like a rollercoaster that kept going up and down — in a good way. "While I thought Rachel was a little too sassy for me at various times, I can see how girls would be able to identify with her. She learns things the hard way and the lessons she offers are presented in such a way that we can truly learn from her mistakes. With a moral lesson to be learned — in this book, forgiveness — Rachel Yoder is a wonderful addition to a family bookshelf. I'm delighted to have stumbled upon these books and am setting them aside for my baby girl. I believe the Rachel Yoder books are a timeless classic that will entertain readers for years to come." 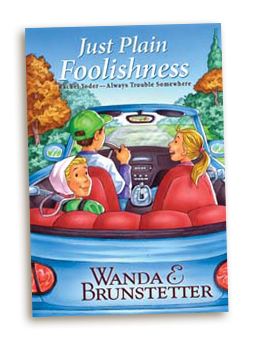 "Wanda E. Brunstetter has created a book for young readers dealing with her favorite subjects. She has written many books about the Amish society; it's exciting to see that she now writes books for younger readers too. Ms. Brunstetter has an easy-to-understand writing style. She includes a glossary of words from the Pennsylvania Dutch dialect and their meanings to help young readers understand the book more. 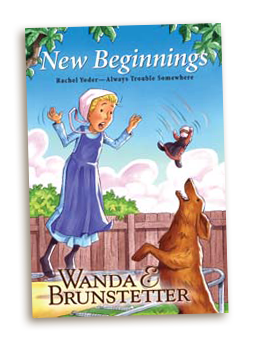 New Beginnings shows a glimpse into Amish society and how, even if your best friend moves away, you can always make new ones." "Looking for positive books for your early to mid elementary-age child? Get them started on this series. Could become addictive." "This is the fifth book in the Rachel Yoder — Always Trouble Somewhere series. I am always on the watch for books that will appeal to my granddaughter, an avid reader. This one fits the bill perfectly. Second grade through fourth grade girls will love this series. In A Happy Heart, Rachel Yoder, usually a pleasant girl, has turned into a grouch. Rachel Yoder needs glasses, and she has too many chores to do. I look forward to sharing this one with my grandchildren." "Being a pre-teen girl myself who recently got glasses, I can understand how Rachel may feel, but I found I really do like my glasses. 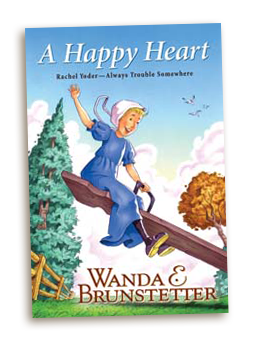 A Happy Heart by Wanda E. Brunstetter is a terrific book for teaching young girls to realize that Amish girls aren't that much different than we are!" amusement park, I can't wait for the next book to see what sort of mischief Rachel finds herself in next." "I love this series. I always know that I can give them to a child to read without worrying about the content. 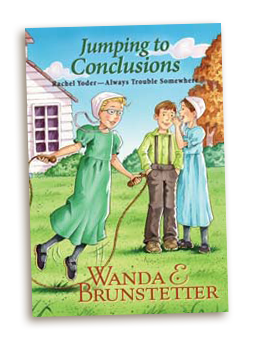 Wanda E. Brunstetter allows readers a glimpse into the Amish lifestyle. Regardless of the culture, girls face the same emotions. They want to be loved, and when a new baby is around, they often feel left out." Somewhere, the author gives young girls a chance to get a glimpse into Amish everyday life. Perhaps Amish girls struggle with the same things that other girls do too. If a girl is suddenly thrust into being a 'big sister' she will really enjoy reading about how Rachel handles it. 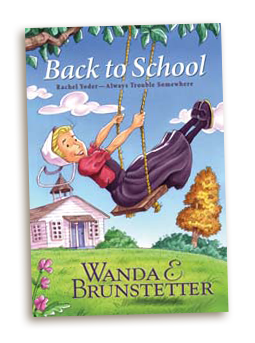 Wanda Brunstetter is an awesome author and I really hope she continues to write more books about Rachel Yoder."